What It’s About: Lane Myer (John Cusack) gets dumped by his girlfriend Beth Truss (Amanda Wyss) for Roy Stalin (Aaron Dozier), the captain of the high school ski team. Between attempts at suicide, Myer tries to win Truss back by challenging Roy to a race down the deadly K-12. Can he survive long enough to notice the French exchange student Monique Junot (Diane Franklin) staying with his disgusting next door neighbors? Why Watch it Today? : Today is International Newspaper Carrier’s Day. One of Better Off Dead‘s memorable running gags involves the Myers’ paper boy, who constantly asks for his “two dollars.” As someone who delivered papers in the 1980s, when paper companies still sold kids papers and expected them to collect the money for the subscriptions from often reluctant to actually pay adults, the scenes involving the paper boy aren’t as far from the truth as you might think. 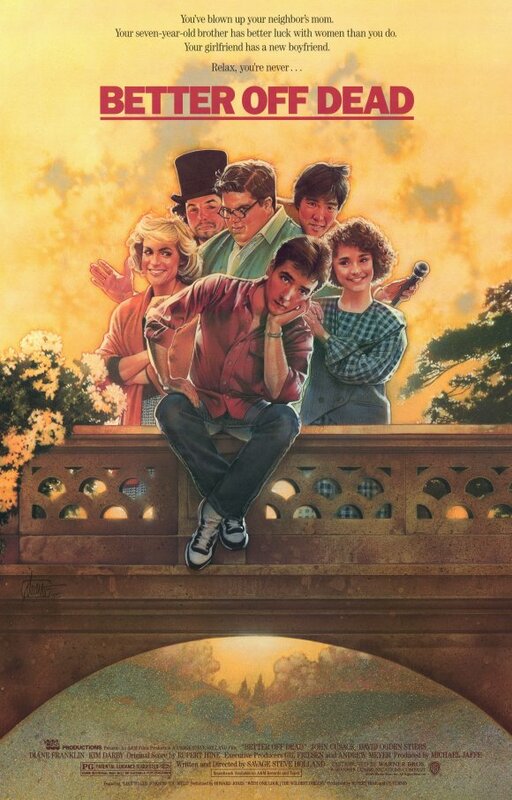 Better Off Dead was animator Savage Steve Holland’s début film, a cult favorite that flopped at the box office but gained an audience on cable. This entry was posted in Animation, Black Comedy, Comedy, Fish-Out-of-Water, Movie of the Day, Slapstick, Stop Motion Animation and tagged Amanda Wyss, attempted suicide, big dance, CBS Entertainment Productions, competition, cult, Curtis Armstrong, Dan Schneider, David Ogden Stiers, Diane Franklin, duel, dysfunctional family, Elizabeth Daily, exchange student, fantasy sequence, France, John Cusack, Kim Darby, montage, musical interlude, out of touch parents, paperboy, Savage Steve Holland, sidekick, skiing, snobs vs. slobs, sports announcer, Steven Williams, Taylor Negron, teens, training sequence, Vincent Schiavelli.